Modern, classic, new, traditional, simple, and complex are adjectives that at some point might seem incompatible but in the hands of Elwyn Boyles serve to define his repertoire of plated desserts, with which he surprises the customers of The French Laundry and helps to supervise the rest of the sweet stations of Thomas Keller’s culinary group, with another three-Michelin-starred restaurant at the forefront, the restaurant Per Se. 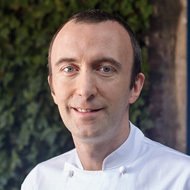 Although his vocation awoke little by little in his native England, soon the trips and the journey through different kitchens made his passion for pastry grow. Among his aptitudes, a zeal for mathematics and an artistic restlessness that comes from his family stand out, both factors become decisive to reliably executing a desserts menu at the level of what is required of a three Michelin star restaurant.